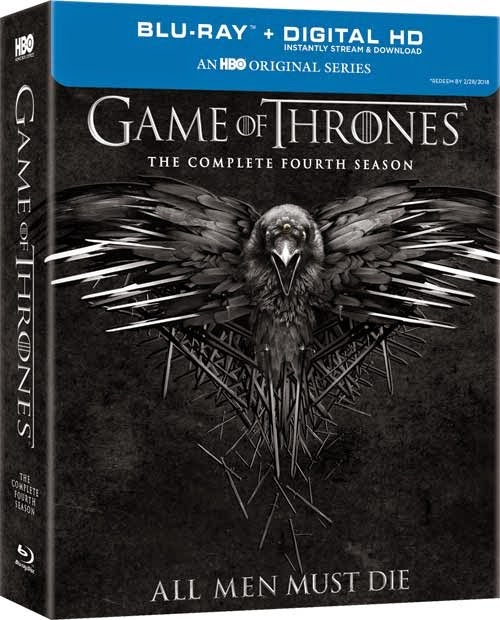 Game of Thrones: The Complete Fourth Season Is Coming to Blu-ray on February 17th! Here's all of the Details! "The most epic, ambitious show on television" (Chicago Sun-Times) is back and bigger than ever when Game of Thrones: The Complete Fourth Season hits stores this winter.Season 4 of the hit HBO series, which broke ratings records and topped The Sopranos to become the most popular show in the network's history, was nominated for 19 Emmy awards including Outstanding Drama Series, Outstanding Supporting Actor in a Drama Series (Peter Dinklage) and Outstanding Supporting Actress in a Drama Series (Lena Headey). One of the best-selling TV on BD/DVD titles in each of its years of release, "Game of Thrones" follows the noble families of Westeros as they battle for control of the Seven Kingdoms. 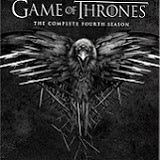 Available February 17, 2015 on Blu-ray with Digital Copy ($79.98) and DVD ($59.99),Game of Thrones: The Complete Fourth Season is packed with exclusive new bonus content including round-table discussions, on-set interviews, audio commentaries, and brand new animated histories giving fans hours of extensive, never-before-seen material. Valar Morghulis means "all men must die." New York, N.Y., July 15, 2014 - Based on George R.R. Martin's best-selling book seriesA Song of Ice and Fire, the fourth season of Game of Thrones features returning cast members Emmy and Golden Globe winner Peter Dinklage (Tyrion Lannister), Nikolaj Coster-Waldau (Jaime Lannister), Lena Headey (Cersei Lannister), Emilia Clarke (Daenerys Targaryen), Charles Dance (Tywin Lannister), Aidan Gillen (Petyr "Littlefinger" Baelish), Jack Gleeson (Joffrey Baratheon), Kit Harington (Jon Snow), Diana Rigg (Lady Olenna Tyrell, Emmy-nominated for her role), Sophie Turner (Sansa Stark), Maisie Williams (Arya Stark), Isaac Hempstead Wright (Bran Stark), Alfie Allen (Theon Greyjoy), Jerome Flynn (Bronn), Conleth Hill (Varys), John Bradley (Samwell Tarly), Gwendoline Christie (Brienne of Tarth), Liam Cunningham (Davos Seaworth), Stephen Dillane (Stannis Baratheon), Natalie Dormer (Margaery Tyrell), Iain Glen (Jorah Mormont), Kristofer Hivju (Tormund Giantsbane), Sibel Kekilli (Shae), Rose Leslie (Ygritte), Rory McCann (Sandor "The Hound" Clegane), Michael McElhatton (Roose Bolton), Iwan Rheon (Ramsay Snow) and Carice van Houten (Melisandre). Returning cast members include: Jacob Anderson (Grey Worm), Thomas Brodie-Sangster (Jojen Reed), Nathalie Emmanuel (Massandei), Ciaran Hinds (Mance Rayder), Finn Jones (Loras Tyrell), Ellie Kendrick (Meera Reed), Kristian Nairn (Hodor) and Gemma Whelan (Yara Greyjoy). New cast members for Season 4 include: Pedro Pascal (Oberyn Martell), Indira Varma (Ellaria Sand, Oberyn's paramour), Roger Ashton-Griffiths (Lord Mace Tyrell), Michiel Huisman (Daario Naharis, a mercenary ally to Daenerys), Yuri Kolokolnikov (Styr, a wildlings chief) and Hafþór Júlíus Björnsson (Ser Gregor Clegane, a.k.a. "The Mountain"). The series executive producers ofGame of Thronesare David Benioff, D.B. Weiss, Carolyn Strauss, Frank Doelger and Bernadette Caulfield; co-executive producers, Guymon Casady, Vince Gerardis and George R.R. Martin; producers, Chris Newman and Greg Spence. In Season 4, while the Lannisters' hold on the Iron Throne remains intact, new and ongoing threats from the south, north and east threaten to tip the scales. As Stannis Baratheon and Daenerys Targaryen continue to grow their respective armies, the arrival of the Lannister-loathing "Red Viper of Dorne" poses a more immediate danger. In the north, the depleted Night's Watch seems overmatched against the advances of Mance Rayder's army of wildlings, which in turn is being trailed by an even more formidable foe: the undead White Walkers. In-Episode Guide - In-feature resource that provides background information about on-screen characters, locations and relevant histories. Histories & Lore - Learn about the mythology of Westeros as told from the varying perspectives of the characters themselves. Behind the Battle for the Wall - Follow the cast and crew as they create the most ambitious battle to date. This 30-minute documentary explores the challenges of putting together one of the series' most intense episodes, with never-before-seen material. The Fallen: A Roundtable - Writer Bryan Cogman sits down with a few of the many cast members who meet their demise inSeason 4. From first learning of their deaths to shooting their final scenes, this 30-minute feature will shed light on what it's like to live-and die-in theGame of Thronesworld. The Politics of Power: A Look Back at Season 3- Revisit the brutal events ofSeason 3to see power shifts that define Westeros at the start ofSeason 4. Bastards of Westeros - Hear showrunners David Benioff & D.B. Weiss and author George R.R. Martin discuss the role bastards play in the Seven Kingdoms. Deleted/Extended Scenes - Two deleted scenes. 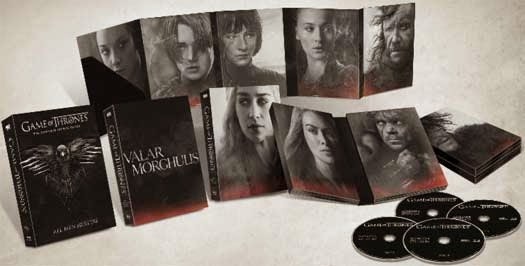 Audio Commentaries - Commentaries with cast and crew ,including showrunners David Benioff and D.B. Weiss,A Song of Ice and Fireauthor George R.R. Martin, Sophie Turner, Maisie Williams, Pedro Pascal, Aiden Gillen and more!